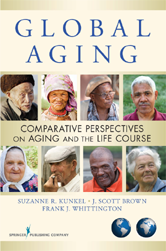 This comprehensive and timely guide includes contributions from international gerontology scholars and illustrates both universal and socioculturally unique aspects of aging across nations. It is organized thematically for ease of use and includes an abundance of photographs and illustrations to highlight key points. Retired and Living the Good Life? Why Is Disability an Important Topic for Global Aging? Future Trends: Adding Years to Life and Adding Life to Years? Differences Within Older Populations—Does Age Matter? What Gives Rise to Retirement? What Do You Call Your Grandmother? Who Provides Care for Older People?